Powers/Abilities: The Night Nurse runs a clinic--open all day and all night--in a secret location where super-heroes can go to get treated for injuries, no questions asked. Secret identities are preserved and there are no legal reports filed. She doesn't charge any fees, though she does occasionally accept gifts. She is financially secure enough that she doesn't do the job for the money; her primary concern is that the heroes are healthy and safe. (Dr. Strange: The Oath#1 (fb) - BTS) - At some point in the past, while still being a medical student, the future Night Nurse was saved by a costumed super-hero. From this day on she decided to care for them with incredible skills as a physician. (Daredevil II#58 (fb) - BTS) - After Daredevil was badly injured in battle with the Yakuza, he was taken to the Night Nurse. (Daredevil II#58) - Foggy Nelson sent Ben Urich to the Night Nurse to find Matt. She initially denied that Matt was there until Matt called the desk and let her know it was ok to send him back, after which she sent him to "the room on the right." (Secret War#1 - BTS / Pulse#9 - BTS) - When Luke Cage was injured during an attack on the participants of Fury's "secret war" against Latveria, he was taken to the Night Medical Center. (Pulse#9) - Ben Urich led Jessica Jones and Kat Farrell to the Night Medical Center to see the injured Cage. He was being watched over by a group of friends including Iron Fist, Misty Knight, Colleen Wing, Bob Diamond, Lin Sun, Abe Brown, and Lotus Shinchuko. After everyone decided it was ok for Jess to go in, the Night Nurse directed her to "the room on the right." While Jess visited Cage, they received a transmission from Nick Fury, checking that they were ok and apologizing for the problems he had caused. (Daredevil II#80 (fb) - BTS) - Ben Urich interviewed the Night Nurse. She hinted that her job was "returning the favor," presumably indicating that a super-hero had saved her at least once. (Daredevil II#80) - After Daredevil was shot by the Paladin under government orders, Elektra followed Daredevil's request to take him to the Night Nurse. The Black Widow arrived shortly thereafter with Milla Donovan. Elektra was less than impressed with the Night Nurse's care and summoned agents of the Hand to treat him. As the Night Nurse was preparing to operate without anesthesia (since she was uncertain of his biological constitution and didn't have time to run tests), Hand agents arrived and physically pulled her away while one of their number channeled healing energy into Matt. (Spider-Man/Black Cat: The Evil That Men Do#6 - BTS) - Spider-Man was taken by Daredevil to the Night Nurse after Francis Klum teleports Black Cat's mask into Spider-Man's neck. (Dr. Strange: The Oath#1) - Night Nurse asked Arana and Iron Fist to come back later when Wong carried in Dr. Strange with a bullet wound. Strange was carried into operation room one where Night Nurse learned during the operation from Strange's astral form and Wong that Strange was shot for Wong's medicine that he had stolen from another dimension. Night Nurse removed the bullet, but couldn't understand why someone would steal a medicine until Strange regained consciousness and revealed that the medicine was able to cure cancer. (Dr. Strange: The Oath#2) - At first Night Nurse didn't want to allow Dr. Strange to leave, but he wanted to help Wong. She only let him go when Strange allowed her to accompany them, so she was able to look after Strange's health after the operation. The trio went through the outer boroughs to Dr. Jonas Hilt, who was the only other person aware of Strange's discovery. When they arrived the sample of the serum was gone, the lab destroyed and Hilt was dead. Strange was sure that Mordo was behind everything. They took a railway and jumped midway into the river to arrive at the secret hideout of their adversary. Night Nurse used her bobby pins to open the door Strange wasn't able to open. As soon as they were inside they were attacked by Stark Security Droids. While Starnge and Wong destroyed them, Night Nurse was taken captive by Brigande, the man who shot Strange. (Dr. Strange: The Oath#3) - Night Nurse was able to free herself with a headbutt. She stayed behind with Wong while Strange travelled into Brigande's mind. When Strange returned he revealed to Night Nurse and Wong that Nicodemus West was behind everything. Night Nurse knew West as an influential person in the pharmaceutical industry, but Strange also knew him as one of the surgeons, who failed to save his hands. Dr. Strange then shocked Night Nurse by locking Brigande in his own mind without a proper process. They returned to Night Nurse's hospice, which they found burning due to the attack by the Marrakant Hellguard West had sent after them. (Dr. Strange: The Oath#4) - Strange told Night Nurse and Wong to leave while he fought the demon, but neither of them listened. In the end both were captured by the demon and Dr. Strange's used Brigande's handgun to kill it. Night Nurse and Wong didn't want to leave Dr. Strange's side when he wanted to go after the wizard on his own. Strange teleported all three to West's hideout where they were immediately trapped by him. After revealing to them that he was taught by the Ancient One as well, how magic didn't help him to cure people and how he got involved with Timely Pharmaceuticals. Dr. Strange had heard enough and easily broke West's binding spell and attacked him to get back the elixir. While he learned that the elixir was the legendary Panacea, a cure for every disease, Wong died in Night Nurse's arms. (Dr. Strange: The Oath#5) - Night Nurse held Wong in her arms. After West fled she told Strange that she would try to get Wong's heart beating again to give Strange the time he needed to get back the elixir from West. Strange was only able to retrieve one drop of the elixir and used it to save Wong, who had been kept stable by Night Nurse. 24 hours later Dr. Strange and Night Nurse were present when Wong woke up in the Sanctum Sanctorum. Night Nurse stayed to look after Dr. Strange's bullet wound. Strange wasn't happy because Timely Pharmaceuticals got away, but Night Nurse had stolen an internal memo at West's lab that incriminated all the higher-ups of Timeley. She had already faxed it to S.E.C., F.D.A. and Matt Murdock, while Dr. Strange was healing Wong. He offered Night Nurse to continue her practice at the Sanctum Sanctorum and she took the offer. (Civil War#2) - At the base of the "Secret Avengers," Night Nurse was present when the Young Avengers arrived. (Civil War: X-Men#2) - At the base of the "Secret Avengers," the Night Nurse treated Captain America (from a battle with Iron Man and his pro-Registration forces) while he spoke with Cyclops over the phone. (Civil War#4) - At the base of the "Secret Avengers," the Night Nurse treated Captain America (and presumably the rest of the "Secret Avengers") after a battle with Iron Man and his pro-Registration forces. (Civil War#5) - At the base of the "Secret Avengers," the Night Nurse treated Spider-Man after the Punisher brought him in following his taking a beating at the hands of Jack O'Lantern and the Jester. (Captain America V#26) - The Night Nurse was present at the unofficial wake for Captain America, held by the "New/Secret/Renegade/whatever Avengers" and other unregistered heroes. (Immortal Iron Fist#2) - Cage brought Iron Fist to the Night Nurse after he had been injured in battle with Hydra and their Mechagorgon. (Friendly Neighborhood Spider-Man#24) - Spider-Man fruitlessly contacted the Night Nurse in hopes that she could help save May Parker. (New Avengers I#34) - After spending the night with Dr. Strange, Linda asked him a few questions. Stephen told her that he let the New Avengers live in the Sanctum Sanctorum because he should've been there for them from the start during the Civil War. He then told Night Nurse to come back tonight, so he could introduce her to the New Avengers. Clint Barton watched Night Nurse leaving the Sanctum Sanctorum. (New Avengers Annual I#2) - At the Sanctum Sanctorum, Night Nurse sat at a table with Jessica Jones and her baby and drank a cup of tea while talking about Night Nurse's adventures. When the New Avengers teleported in she took care of Maya Lopez and then Dr. Strange, who acted weird. Wong and Night Nurse stayed at Dr. Strange's bed and didn't know what caused his pain. She was present when suddenly the Hood entered the room and shot Dr. Strange. Dr. Strange seemed dead, but a few moments later he was alive again and left his room to help the New Avengers against Hood's gang with the power of Zom. Wong and Night Nurse followed Stephen moments later and saw that everyone except for him was lying on the ground in pain. Wong used a spell to free the New Avengers from the pain while Night Nurse held Dr. Strange. Moments later Ms. Marvel and SHIELD arrived to arrest the unregistered heroes, but she decided to let the heroes and Night Nurse go. (Dark Reign: Elektra#3 (fb) - BTS) - Night Nurse heard about apparent frauds committed by people in the wake of the Skrulls' secret invasion, using the alien mimics as an excuse to avoid repercussions for past misdeeds. (Dark Reign: Elektra#3 (fb) - BTS) - Foggy Nelson contacted Night Nurse and took the severely wounded Elektra to her for help. Knowing Elektra's violent reputation, she handcuffed Elektra to the bed. (Dark Reign: Elektra#3) - Elektra woke to face Night Nurse and quickly freed herself from the handcuffs. Vengeful former S.H.I.E.L.D. Agent Nico attacked the room, gunning for Elektra, who saved Night Nurse from getting shot. Elektra told Night Nurse to run while she went after Nico. (Dark Reign: Elektra#4) - Night Nurse called Wolverine for back-up to help Elektra. (Marvel Divas#2) - Night Nurse did a quick physical examination before helping Dr. Strange perform a mystical examination to confirm Firestar's breast cancer. She then helped organize a time for Firestar to see Dr. Henry Pym. (Marvel Divas#3) - Night Nurse administered the initial chemotherapy treatment to Firestar and advised her (with Patsy Walker present) of what to expect with the cancer and potential side effects of the treatments. (New Avengers I#57) - In Brooklyn, the New Avengers brought in Luke Cage to Night Nurse, who was sporting a new look. Cage was unconscious and injured after a cardiac attack. She dismissed all but Ms. Marvel (Carol Danvers) and told her that they needed to get back to whoever had disrupted their powers earlier so that Cage could be helped. (New Avengers I#58) - While Norman Osborn's villainous Avengers took away the inert form of Cage, Karla Sofen (posing as the new Ms. Marvel) threatened to arrest Night Nurse, who had meanwhile emailed reporter Ben Urich of the surrender and violent arrest of Luke Cage. Sofen could go no further after the defiant Night Nurse warned her of possible civil rights violations. (Daredevil V#512) - Night Nurse tried unsuccessfully to stop Dakota North from speaking to the severely injured Black Tarantula, who was recuperating in her secret Chinatown clinic. (Daredevil IV#16) - Night Nurse was on hand at Avengers Tower in Tony Stark's armor room, helping Dr. Strange, Stark and Hank Pym to heal Daredevil's brain (see comments). (Power Man and Iron Fist III#14) - Unsure what to do with the victims affected by young crimelord Alex Wilder's demon blood drug, Luke Cage, Iron Fist and Senor Magico took the comatose zombie-like bodies to Night Nurse, but she admitted to never encountering anything like that. (Defenders V#2 (fb) - BTS) - Black Cat dropped off Luke Cage, who had been poisoned by the vengeful Diamondback. Night Nurse stabilized Cage and was able to get Blade hunting the high-security antidote. She contacted Cage's wife, Jessica Jones, to visit him bedside. (Defenders V#2) - Night Nurse administered the antidote by a makeshift nasal plunger, saving Cage's life. Jones asked for Diamondback's whereabouts, but Night Nurse refused to yield information as she felt it would compromise her clinic and leave vigilante heroes with no safe place for emergency treatment. Comments: Created by Brian Michael Bendis (writer) and Alex Maleev (art). Night Nurse joked with Firestar and Hellcat in Marvel Divas#3 that "it's practically my mutant ability" to find a vein when administering needles. 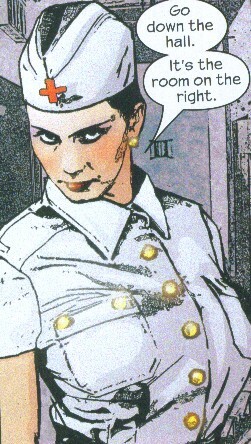 In Daredevil IV#16, Night Nurse appears in her original outfit in one frame only. When Daredevil finally revived, Night Nurse had evidently left as he could only hear the three male Avengers' heartbeats. Regarding the Night Nurses under clarifications: Christine Palmer has since shown up in Nightcrawler, and it is POSSIBLE that Linda Carter (or her predecessor "Linda Carter, Student Nurse") might be the Night Nurse in recent Daredevil issues. I haven't seen Georgia, though. For more information on Linda Carter, Student Nurse, see here: http://www.netwrx1.com/CherryAmes/lindacarter.html. She could easily be Linda's aunt, or great-aunt, or something. It's always the room on the right. Thanks to Doctor Worm (Jacob Cundiff) for pointing out the Spider-Man/Black Cat appearance. I think I'm about a full year behind at indexing the limited series at this point. For what it's worth, before we stopped working for Marvel, Roy and I discussed (with editor Mike Rockwitz I think) a semi-humorous one-shot entitled NIGHT NURSE & FIN FANG FOOM: TOGETHER AT LAST in which NN would have married FFF. A possible revamp of the title was mentioned jokingly a couple of times back in those Year-in-Review satire magazines Marvel published in the 1990s, where IIRC it was suggested that the title could be given a horror slant or set in 2099 (two of the bigger franchises of 1990s Marvel). Profile by Snood. Updates by Markus Raymond (Dr. Strange: The Oath & a few other issues) & Grendel Prime (Elektra, Divas plus a few other issues).